The style of this piece I guess could be classified under "zombie" but I was going for a look of deterioration. I wanted the face to look like it was deteriorating and skin was breaking off. I also wanted to create a somber aesthetic about the piece. To make the piece gloomy I used pencils as my medium making it black and white and made her grab her face like shes feeling for where her skin went. 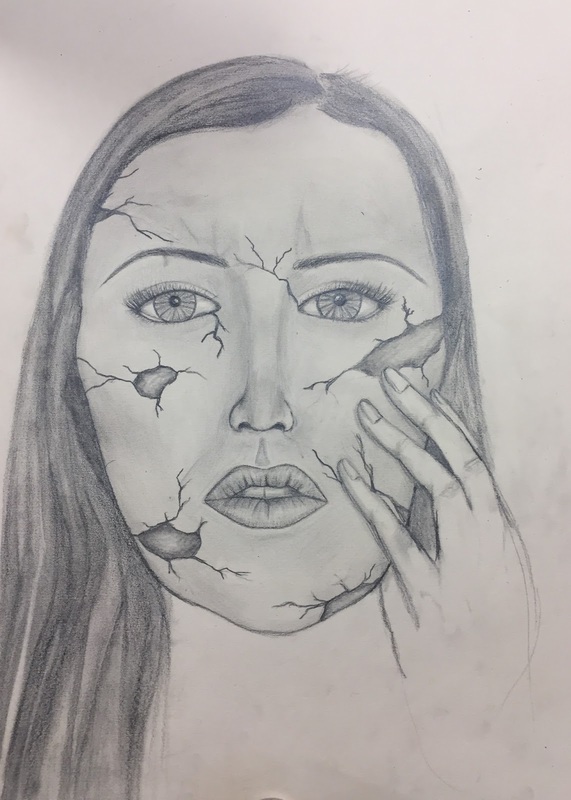 As for the skin I had to add depth to create the illusion that what you saw was actually underneath the skin where it had broken off. Around the sides of the skinless patches I shaded darker so it looks as if the skin is peeling up on the edges. For the rest of the face I shaded according to the shapes of my features. For example my cheekbones are high up so I shaded higher up on the side of my face. It's hard to tell in this picture but above the eyebrows I shaded in creases on my skin to add to the more worried facial expression I was going for. I think my piece turned out pretty well but there's definitely a lot I could work on. I'd like to get better at shading the face to create its shape, making more realistic looking hair and drawing hands. I'm not gonna be too hard on myself though because it was my first portrait and I shouldn't expect it to look just like me. I know my eyes and nose and mouths and such will get better with practice and same with the hair. Everything gets better with practice!! My favorite part about the piece is the concept of deterioration I think it can be interpreted in many ways and is very metaphorical.